According to many industry observers, we are today on the cusp of a Fourth Industrial Revolution. Developments in previously disjointed fields such as artificial intelligence and machine learning, robotics, nanotechnology, 3D printing and genetics and biotechnology are all building on and amplifying one another. Smart systems—homes, factories, farms, grids or entire cities—will help tackle problems ranging from supply chain management to climate change. Concurrent to this technological revolution are a set of broader socio-economic, geopolitical and demographic developments, each interacting in multiple directions and intensifying each another. 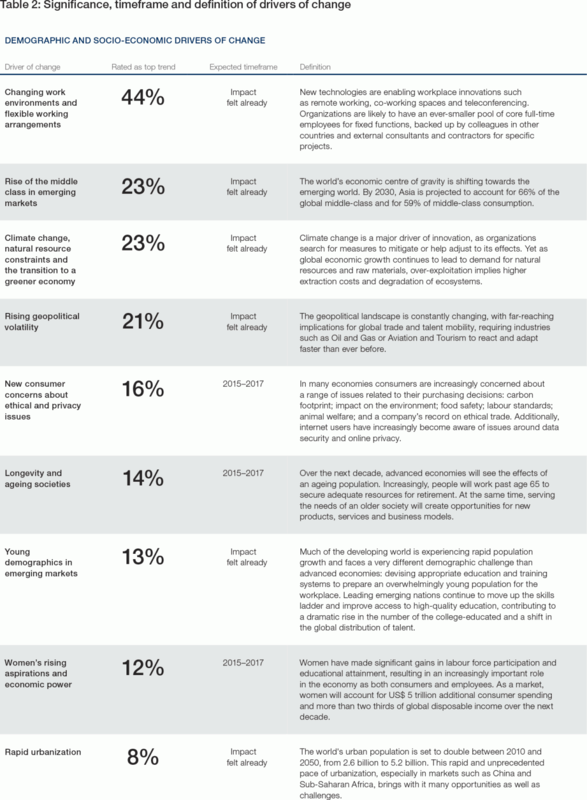 While these impending changes hold great promise for future prosperity and job creation, many of them also pose major challenges requiring proactive adaptation by corporations, governments, societies and individuals. As whole industries adjust and new ones are born, many occupations will undergo a fundamental transformation. Together, technological, socio-economic, geopolitical and demographic developments and the interactions between them will generate new categories of jobs and occupations while partly or wholly displacing others. They will change the skill sets required in both old and new occupations in most industries and transform how and where people work, leading to new management and regulatory challenges. Given the rapid pace of change, business model disruptions are resulting in a near-simultaneous impact on employment and need for new skill sets, requiring an urgent and concerted effort for adjustment. So far, the debate on these transformations has been sharply polarized between those who foresee limitless new opportunities and those that foresee a massive dislocation of jobs. In fact, the reality is likely to be highly specific to the industry, region and occupation in question and the ability of various stakeholders to successfully manage change. A major goal of this Report is to unpack the relative impact of key drivers of change and provide specific information on the relative magnitude of these expected changes by industry and geography, and the expected time horizon for their impact to be felt on job functions, employment levels and skills. 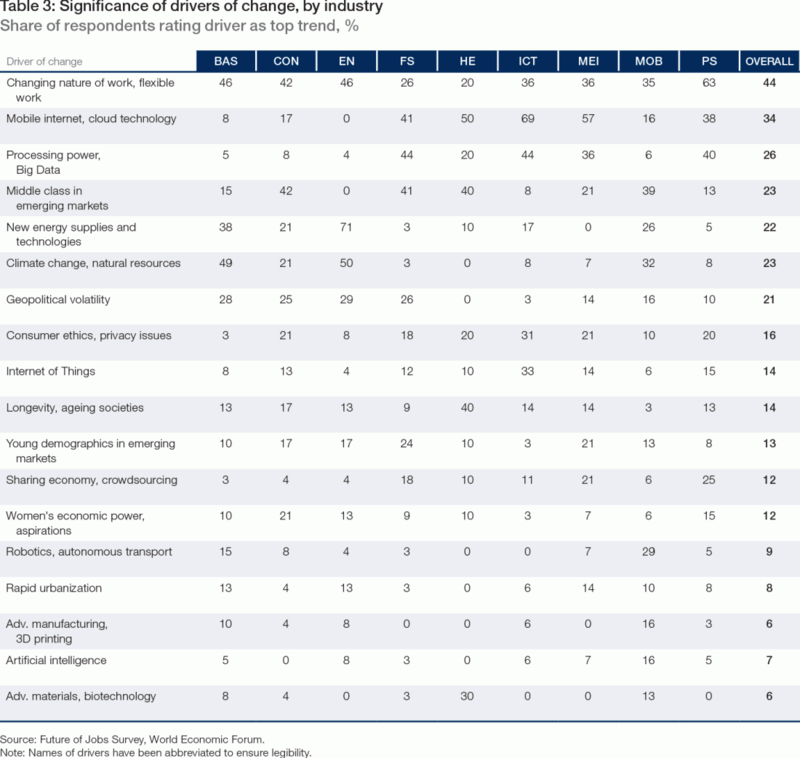 Figure 2 lists the major industry drivers of change and disruptions to business models identified by the senior executives in our survey, ranked according to the share of respondents who expected each trend to be among the top trends impacting their industry by the year 2020. 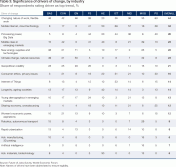 Table 2 provides a short description of each trend and the median time horizon by which it is expected to start impacting the respondent’s industry. 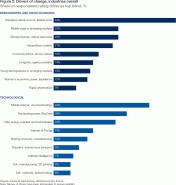 Collectively, technological disruptions are seen as very significant drivers of industrial change by the respondents. Among these, growth in cheap computing power and the ubiquity of the mobile internet have already had widespread impact on existing business models. Additionally, even technological trends whose potentially far-ranging implications have not yet fully materialized—such as 3D printing, artificial intelligence and the Internet of Things—are expected to be well underway in specific industries in the years leading up to 2020. Demographic and socio-economic shifts are expected to have nearly as strong an impact on business models and organizational structures as technological change. Application of technology has already changed when and where work is done in practically every industry as workplaces of the industrial age give way to work practices of the digital age, including remote work, flexible work and on-demand work. The rising middle class in emerging markets, the need to transition towards an environmentally sustainable economy and increased geopolitical volatility are all seen as major organizational drivers of change. Changing values and the growing ability of consumers to express these values are also transforming business models and employment. The rising role and importance of women in the economy is transforming not only the composition of the talent pool but also the nature of products catering to them specifically—and by extension the skills profiles of the jobs required. Longevity and population ageing in advanced economies—and the opportunities and challenges it presents—are also expected to have an impact on business models, and by extension talent needs, in addition to changing the composition of the talent pool in most developed economies in particular. 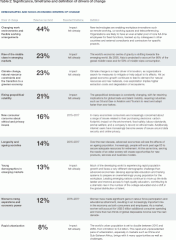 A number of drivers of change will have an acute impact within specific industries. At the industry level, for example, new energy supplies and technologies will have a particular impact on the Energy, Basic and Infrastructure and Mobility industries. Processing power and Big Data will have an especially strong impact on Information and Communication Technology, Financial Services and Professional Services. The rising middle class in emerging markets will have the largest effect on Consumer, Financial Services and Mobility. Consumer ethics and privacy issues will have a significant impact on the Consumer, Financial Services and Information and Communication Technology sector (see Table 3). At the country level, expectations regarding the nature of upcoming disruptions are shaped by the demographic, economic and technological development of the country in question. Overall, changing and flexible work is seen as the most significant driver of change in advanced economies, whereas the rising middle class takes this role in emerging markets. New energy supplies and technologies are expected to play the largest role in the countries of the Gulf Cooperation Council, while climate change adaptation is seen as a particularly major driver in Germany. A number of developing countries expect particularly large impact from the mobile internet given that the technology has the potential to bring millions of formerly unconnected workers and consumers into the formal economy for the first time. For further details, please also refer to the Country Profiles in Part 2 of this Report. The time-to-impact trajectory of certain drivers of change differs between industries and is shaped by the specific nature of each sector’s current business model. 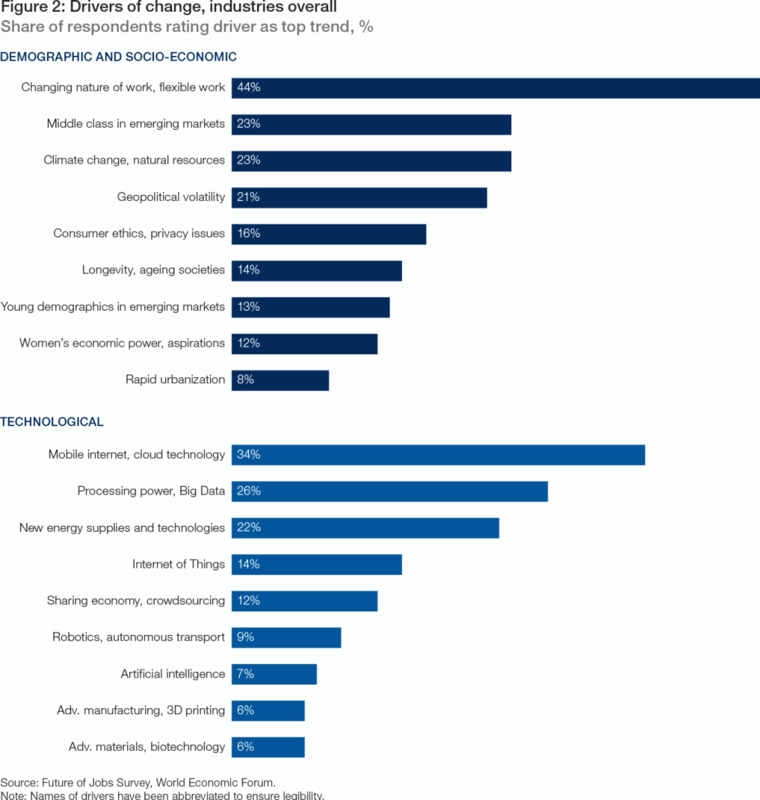 For example, there is a wide variety of opinion among Chief Human Resources Officers regarding the immediacy of the impact of artificial intelligence and robotics on employment and skills.5 However, regardless of the specific industry or driver of change, it is clear that the overall pace of industry transformation is wholly unprecedented. 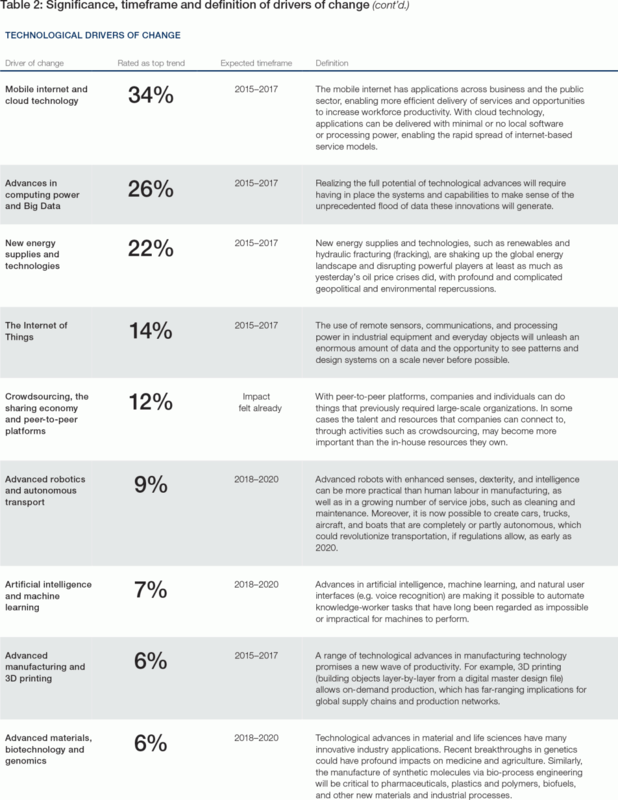 Disruptive changes to industry sectors are already re-configuring business models and skill sets—and will do so at an accelerated pace in the next five years. The current anxious debate about the long-term impact of artificial intelligence and robotics notwithstanding, our focus is on today’s workforce and talent strategies and how they can contribute to successfully managing this transition. 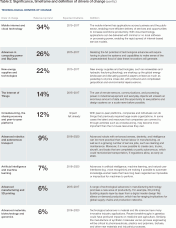 5 A recent World Economic Forum report, in collaboration with the Global Agenda Council on the Future of Software and Society, found that a significant number of disruptive technological changes are expected to reach a‑in the early years of the next decade, with the earliest expected to fully take hold by 2018 and the latest by 2027 (see: “Deep Shift: Technology Tipping Points and Societal Impact”).